Fry the sweet-pepper strips in a bit of olive oil until cooked. Put aside. 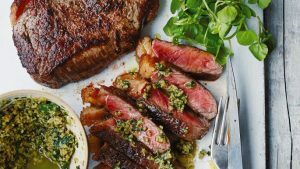 Spread olive oil on the rump steak and rub a layer of salt and pepper into the rump steak. Fry the rump steak in a hot pan until the meat has sealed, approximately 5 minutes on each side. This rump steak is still reasonably red inside. Depending on how you like your meat, you can keep it over the heat longer if you do not want it very red. Remove the rump steak from the heat to rest aside. Spread some of the tapenade over the rump steak. Crumble the goat’s milk cheese over the tapenade. Put four of the sweet-pepper strips on top of the goat’s milk cheese. Squeeze some of the lemon juice over the sweet-pepper strips. A winner in every book.